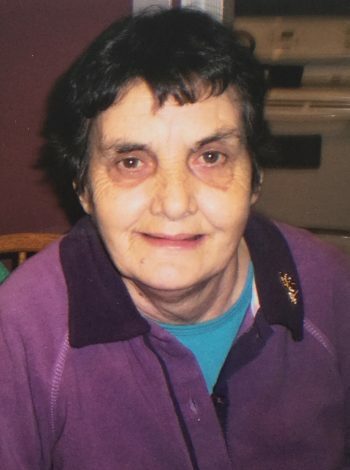 Dorothy Jean, aged 69 years, lost her battle with cancer on Sunday March 11, 2018. She is now reunited with her loved ones gone before her: daughter Beverley; parents Mary and Lewis; and brother in law Clarence. Leaving on this earth to mourn her passing: her son Levi (Wanda Lee); granddaughters Amber and Rebecca; sisters Lorraine, Annie (Brian) and Marg (Richard); brother Lewis (Nellie); special nieces and nephews Junior (Donna), Debbie (Michael), Tina (Eddy-deceased), Margie, April (Alex), Carrie (Ashley), William, and Wanda (Charlie); also, a large number of other relatives and friends. A special thank you to her sister Lorraine, who cared for and watched over her sister so unselfishly through her battle. She stood by her side through thick and thin and words could never describe our gratitude and sincere appreciation for all she has done. Thank you, as well, to her public health nurses Mary and Katie, and the staff of 4SB, who kept her comfortable during her hardest time. Resting at Carnell’s Funeral Home, 329 Freshwater Road, on Monday and Tuesday from 2-4 and 7-9 p.m. Funeral service will take place on Wednesday March 14 from St. Lawrence Anglican Church at 11:00 a.m. In lieu of flowers, donations may be made to St. Lawrence Anglican Church GA Girls Group. Sorry to hear of Dorothy’s passing. Our thoughts are always with you. Levi and all family members… so sad to hear of Dot’s passing. i remember many moons ago when i worked at Drover’s she would come in and we would always have a laugh. She was a lovely lady. Take care and God bless. So sorry for your loss. Please accept our sincere condolences. Our sincere condolences to the Crane and Churchill families, so sorry for your loss. Very sorry for your loss.. Please accept my sincere condolences. Levi, Wanda Lee & family. our deepest condolences to all the family, our thoughts and prayers are with you all at this sad time. Levi, Wanda Lee, and family – Please accept our condolences on the loss of your mother/grandmother, our thoughts and prayers are with you during this difficult time. April and Alex and family we are very sorry for your loss. We know how much your Aunt Dot meant to you. You are in our thoughts and prayers today and in the days that follow. So sorry for your loss, our thoughts and prayers are with you during this very difficult time. Our thoughts and prayers go out to the Crane and Churchill families. by Ethel Picco and family.